The husband’s secret isn’t just the name of a wildly popular book by Liane Moriarty, it’s also become a hugely popular plot in women’s fiction. All over Amazon.com are women whose husbands have died suddenly, leaving wives to discover second families, drained bank accounts, secret identities, and other horrors. But it’s a plot that works – these books get published, and I gobble them up like Oreos. The latest entry in the “guess what you didn’t know about your dead husband” file is Abby Roberts, one of two protagonists in Rachael Herron’s new novel, The Ones Who Matter Most. Abby’s husband Scott conveniently drops dead just moments after she asks him for a divorce. Abby had been trying to get pregnant again after several miscarriages, and Scott secretly had a vasectomy. Going through his papers, Abby discovers that Scott’s vasectomy wasn’t his only secret. She finds wedding photos and a picture of him cradling a newborn. There are also canceled checks to Fern Reyes. Abby tracks down Fern to tell her of Scott’s death, and finds out that Scott’s son, Matty, is eleven. Scott had abandoned them just hours after Matty’s birth, although the checks came every month. And Scott’s father isn’t dead either, as he’d told Abby: When Scott left, Wyatt chose his daughter-in-law and new grandson, and now lives with them (and another boarder) in a tiny home in a broken-down neighborhood in Oakland, California. The book is less about Scott and his secrets, and more about Abby and Fern’s burgeoning relationship. The two are quite different – white, American Abby is economically set but lacks a family of her own. Hispanic Fern is barely making ends meet as a bus driver, but she’s taking night classes in business and her family is small but supportive. She is also incredibly proud – when Abby offers her Scott’s life insurance money – a life-changing amount – Fern refuses it. But eventually she opens the door to Abby just a crack – enough to let her play a small role in Matty’s life. Fern’s brother Diego also figures into the story, in a plot twist that some might see as too convenient. While both protagonists are multi-dimensional and real, Fern comes across much more strongly than Abby. (It is written from both women’s third person points of view.) Fiercely protective of her son, tired from working hard but never indulging in self-pity, Fern feels whole and real in a way that Abby just does not. Perhaps that’s because while Herron is so detailed in her explanations of how Fern met Scott, why she’s in the economic situation she is, and her family background, she leaves readers to fill in the blanks about Abby. There’s some mention of dead parents who never stopped mourning an older sister Abby never met, but I never got a sense of what her life was like when she was growing up. Did she love anyone else before meeting Scott? And how did she end up so well off, anyway? Also missing in a huge way was Scott. In other books with this plot, the writer takes pains to try to explain – mostly in flashback – what motivated the husband to live his double life. Why would a man abandon his wife and hours-old son, but continue to pay (legally unnecessary) child support every month? What does it say about him that his own father then turned around and abandoned him? The reader never finds out, because Abby, Fern and Wyatt never try to understand Scott. Still, this is a moving book, and readers will root for Abby, Fern and Matty to form their own atypical family. Relationships are at the heart of women’s fiction, and Herron could teach a master class on creating them. 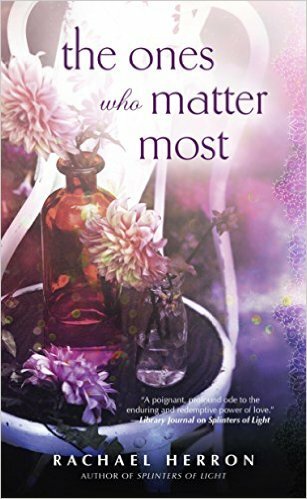 Readers who enjoyed Herron’s Splinters of Light, about another atypical family facing early-onset Alzheimers, will appreciate The Ones Who Matter Most. There’s enough material left over for a sequel, and I hope Herron offers one. Great review. This book sounds like it will be very interesting.